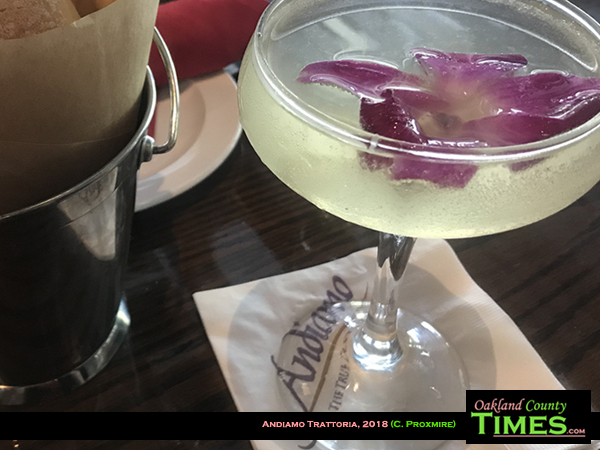 Clarkston, MI- With so much talk about Andiamo closing their Royal Oak location, it occurred to me that I hadn’t been there yet. 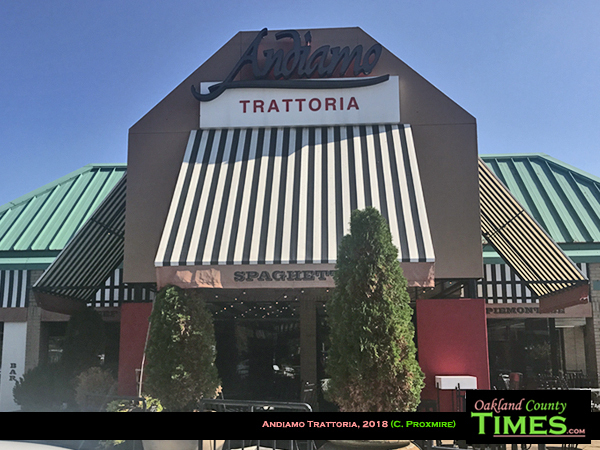 So on a recent visit to Clarkston I took the opportunity to dine at Andiamo Trattoria at 7228 N Main St. 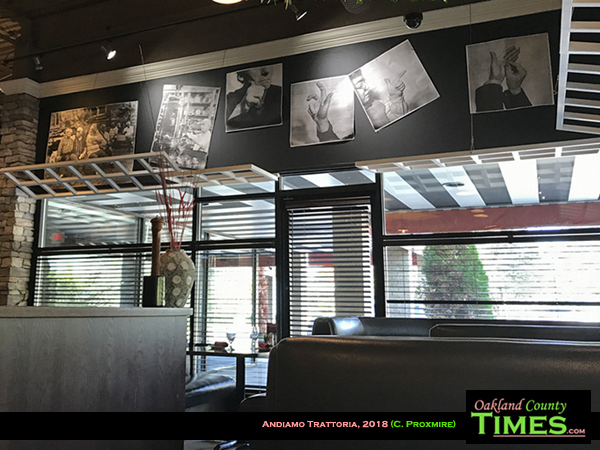 While it is a lovely place for fine dining, it also had this great, laid back atmosphere and friendly staff. Several business people were there for lunchtime meetings and the nice comfy booth I had was great for getting work done and feeling like a hard working executive myself. For an empowering and silly cocktail I ordered “Kiss the Ring,” which is Stolichnaya Razberi, St. Germaine, Fresh Lime Juice, Simple Syrup, and White Cranberry Juice served with an orchid flower floating on top. The orchid ended up pressed between pages of my planner when the meal was over because I felt it was too pretty to be tossed away. This drink was perfectly sippable and went well with my lunchtime meal. 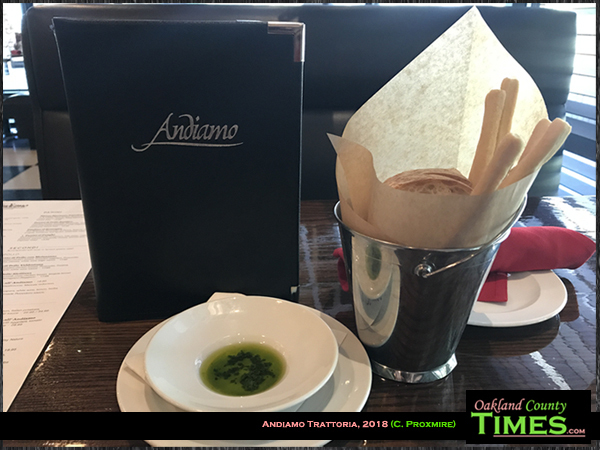 There are many pasta choices at Andiamo, as well as other Italian favorites. 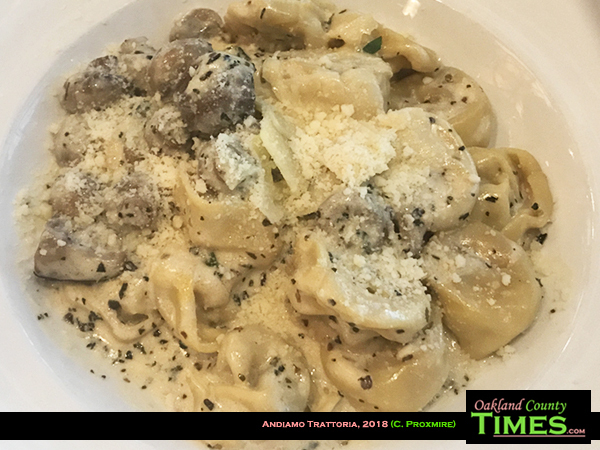 The Tortellina Alla Panna is handmade tortellini filled with beef, pork, and veal, served with basil and Mascarpone crème. Words cannot really describe how delicious this dish is. And abundant. I had enough left over for dinner later that night. They also start guests off with bread and olive oil for dipping. 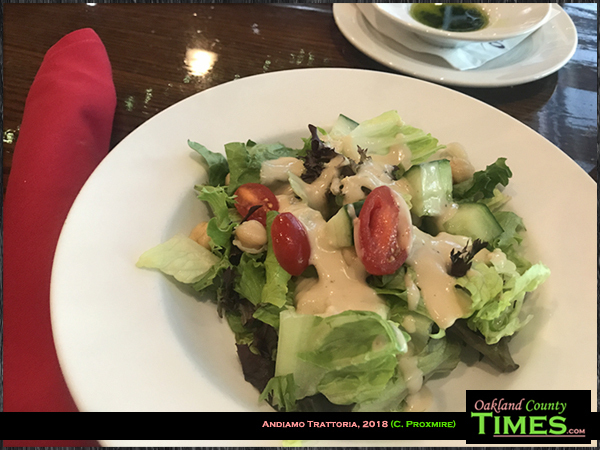 The pasta came with choice of soup or salad, and I got my salad with the house specialty – garlic Parmesan dressing. I probably didn’t need to order desert, but when the waiter brought out a tray of sweets the temptation was too great. 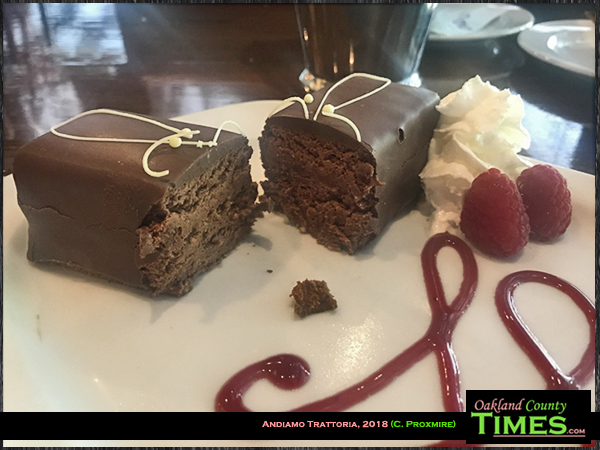 The Twix is a rectangle cake with two layers of chocolate mousse with a layer of wafer in the middle, coated with chocolate. It’s served looking fancy with a puff of whipped cream, a pair of raspberries and a design of raspberry sauce. I’m not usually a chocolate fan, but this was a good choice. The mouse was melt-on-my-tongue fluffy. The half that I took home was pretty much pudding by the time I got to eat it, but believe me that was fine too. I was really happy with this location, especially since it had plenty of parking and seating, which can be hard at Clarkston restaurants. There are locations in Bloomfield Township, Clarkston, Dearborn, Detroit, Livonia, Sterling Heights, and Warren, with one in progress in Fenton. 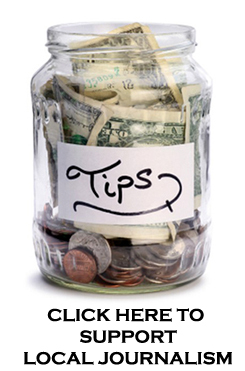 Learn more at http://andiamoitalia.com/.